Filling in the who-did-what blanks in the plot summary. Which, since I wrote it (the IMDb summary, not the plot), I presume I can do. Susan Reed was a folk singer,born in Columbia, South Caroline with part of her childhood years spent in Ashville, North Carolina, working mostly in NYC night clubs (Cafe Society Uptown for one), who usually accompanied her songs playing either a zither (mostly), harps or lutes. 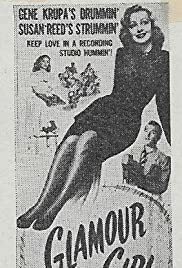 Her songs in this film were: "Turtle Dove," "The Soldier and the Lady," "Molly Malone," "Go Way From My Window" and "Black is the Color of My True Love's Hair." While billed 5th in the cast, she did get all upper-case letters but shared the line with a musical instrument...as in SUSAN REED AND HER ZITHER. Susan's Reed's non-P.C. attributes included more than just her zither. Jack Leonard (not the comedian Jack E. Leonard) was a former vocalist with the Tommy Dorsey Orchestra and sings Jule Styne's and Sammy Cahn's "Anywhere" and "Without Imagination" written by Columbia Pictures' resident (mostly) songwriters Allan Roberts and Doris Fisher. The musical offerings from the top billed GENE KRUPA AND HIS ORCHESTRA (16 musicians and vocalist Carolyn Grey)included a novelty number, "Gene's Boogie", by Segar Ellis and George Williams, and Krupa's rewritten-version of Rubenstein's "Melody in F."